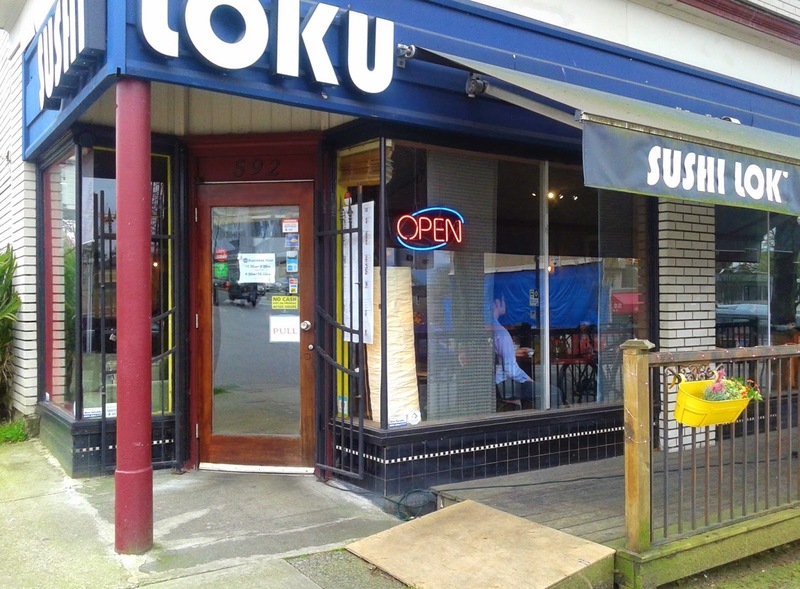 During my online search for a sushi restaurant on Broadway to try out, I came across Sushi Loku. I opened their website and the first thing that I saw was the words "Best sushi on Broadway" in a big font. Well, I guess I needed to look no further. After all, what can possibly go wrong with a restaurant that is confident enough to say "Best sushi on Broadway"? Sushi Loku is a medium-sized, Korean-operated restaurant that has been converted from a former café. When I walked in, I was hit with the smell of a retro American diner. Fortunately, things smelled a little more sushi-like over in the main dining area. Also, it was great to see a large variety of dishes at very affordable prices on the menu! 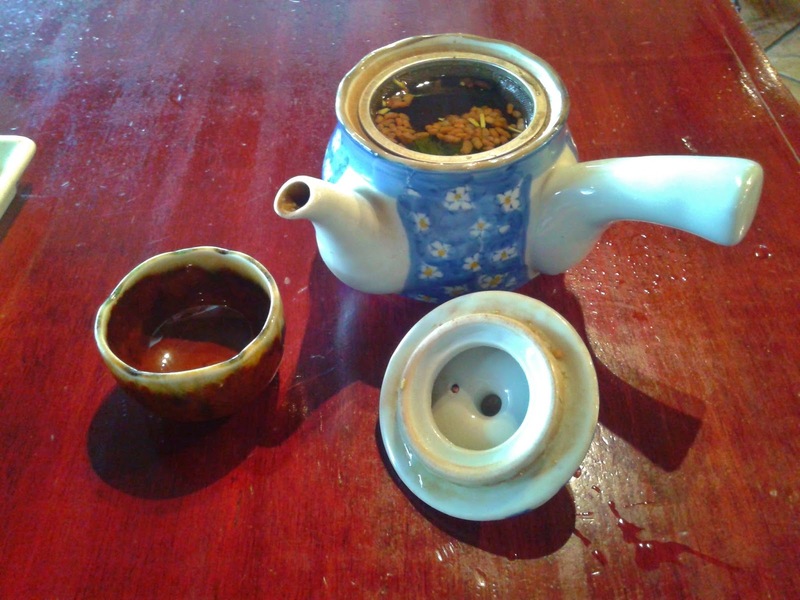 While I was waiting for my food, I was served a teapot of Genmai Japanese Green Tea. It had a nice rice-infused flavour and when I opened the lid of the teapot, I could see little grains of brown rice floating around. This was one of my favourite parts of the whole meal. I ordered the Appetizer Sashimi, which came with two pieces each of tuna, salmon, and sockeye salmon as well as one piece of hamachi. It had quite a bit of variety for just $8.95! 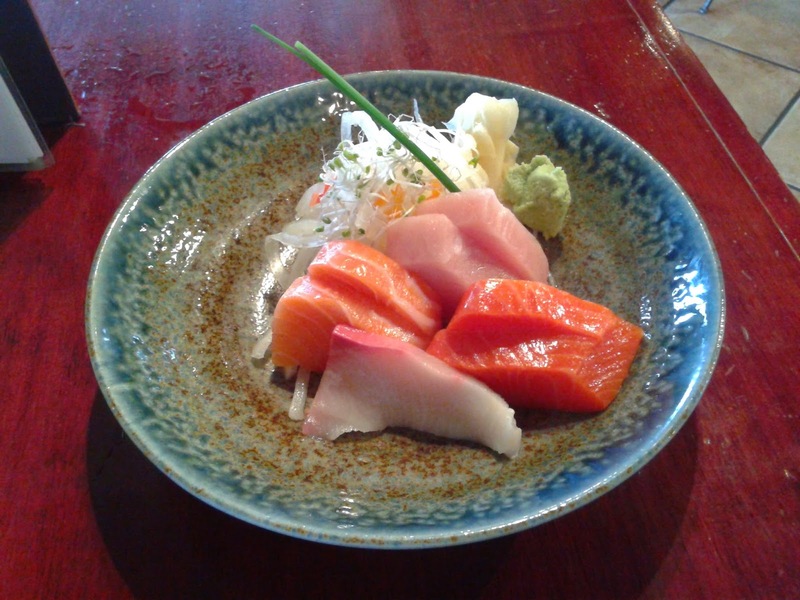 The Tuna Sashimi was fresh with a soft texture and a balanced taste. Both kinds of salmon could use more flavour and the Atlantic salmon was chewier than expected. The Hamachi Sashimi was most likely the farmed variety as it was quite fatty and not very rich in taste. 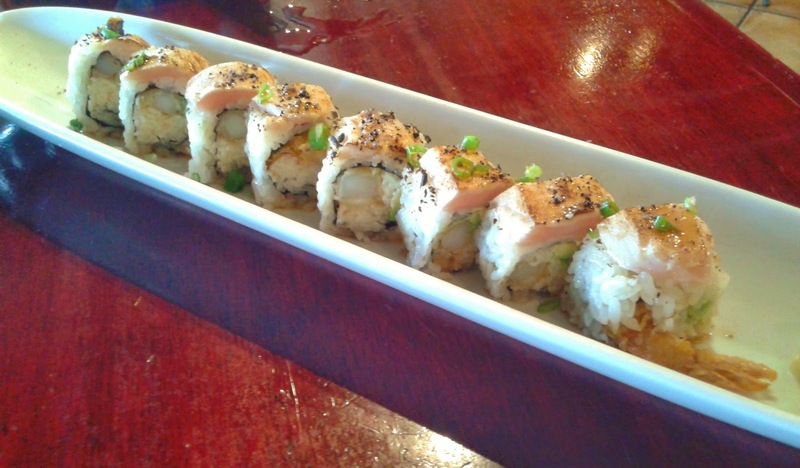 The Tuna Tataki Roll consisted of prawn tempura, crab meat, avocado, seared tuna, green onion, and ponzu sauce. It was neatly constructed and the tuna had a delicious seared flavour. The tempura had a nice crunch to it, and the use of ponzu sauce made this roll taste unique. Be careful though as ponzu sauce and soy sauce don't really mix well together. I've never seen a Prawn Tempura Roll as a hosomaki (small roll with seaweed on the outside) before, so seeing this on the menu made me quite curious. It didn't really work out as well as I thought it would. 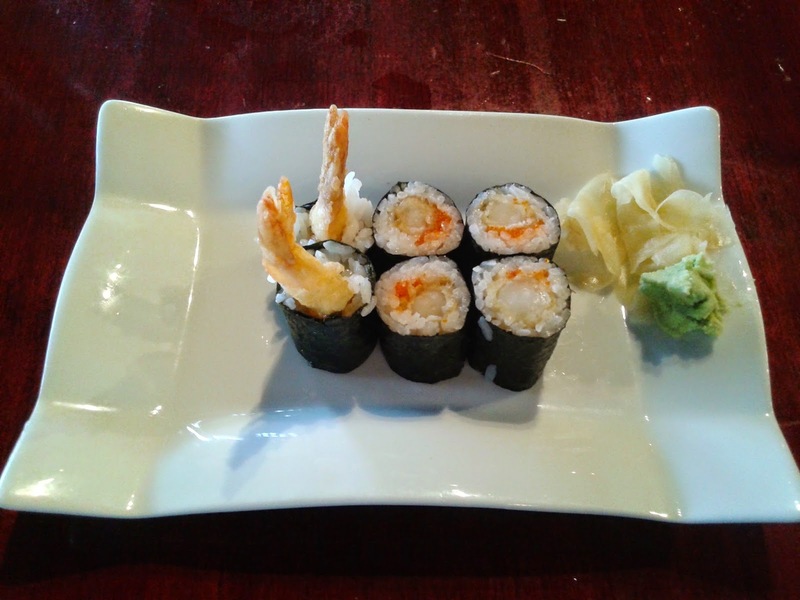 The roll was rolled up a bit too tightly and the crispiness from the prawn tempura disappeared. 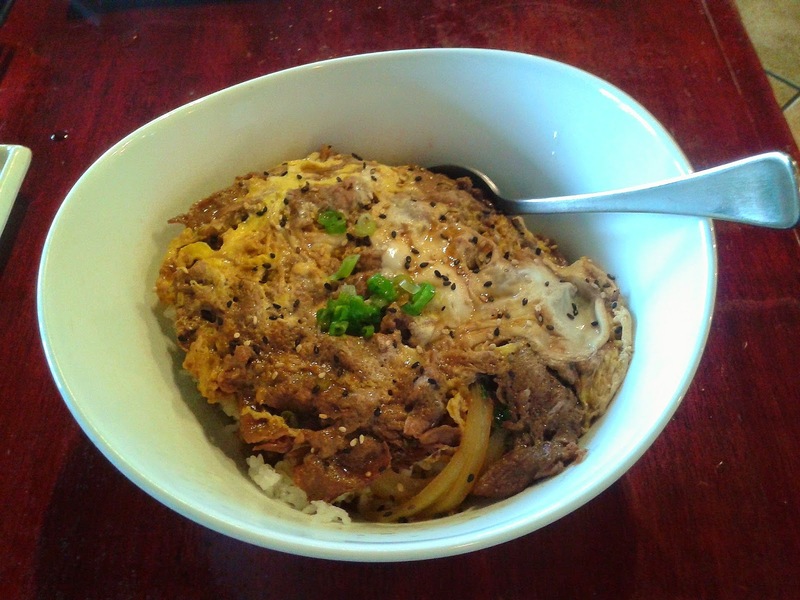 The Beef Sukiyaki Don was served in quite a large portion and consisted of soft beef in a rice bowl with Japanese-style scrambled eggs, green onion, onion and sweet soy sauce. The beef was sufficiently soft and rich in flavour. The egg gave the rice bowl a bit of a katsu-don aroma. While the rice was mushy in places, I liked how it was adequately dressed. The service was adequate and friendly, although by 3 p.m., the servers were already setting up for their break-time meal. The prices were very reasonable and were about halfway between my $ and $$ ratings, so I gave them the benefit of the doubt and categorized them under $. The Tuna Tataki Roll was the highlight of the meal (along with the tea), and it seemed that several other diners were thoroughly enjoying their special rolls as well. I don't know about "Best sushi on Broadway", but "Affordable sushi on Broadway" sounds about right. I've had one lunch there, a combo of classic nigiris and sashimis. While I don't recall specifically what I had, I do remember the experience as being above average. And having being familiar with their interior when it was Seb's (where I ate a few times in the 2000s), I kind of enjoyed the different decor and ambiance from your typical sushi restaurant. But when I'm in this part of Mt. Pleasant I'm more tempted to go to Sushiyama where I just love the katsu meals, as well as their box sets, for amazing value, speed and service. I'm actually more tempted to go to Sushiyama too because I've had some tasty special rolls there. I actually go there so much that some of the servers remember me by name. LOL! Best sushi on Broadway between Clark and Main would still be a difficult title to get as that would include Sushiyama and Hime Sushi, both of which are above-average Japanese restaurants! Yeah Sushiyama folks recognize me too. At our Chinese NYE dinner at Ho Yuen Kee, I saw and recognized one of Sushiyama's waitresses having dinner with her friends and she recognized me too, LOL. I've not eaten at that Hime, only the one on W.10th. Otherwise the area is a bit of sushi wasteland. I haven't been to Sushiyama since I started my blog because I keep getting lured into Sushiyama by their great prices. What are your thoughts on the Hime at W. 10th? I've passed by it a few times but I've never been inside. Last time I was at that Hime was I think mid-2012. I can't say I recall what I ordered, but I don't remember anything bad in any way. It's a clean, friendly place, not too big and can get busy and crowded at peak times. Of all the other casual sushi places along 10th I'd go to Hime first, 'tho I think in recent years there's a couple of new and more "upscale Japanese restos in that area ? That sounds similar to my experiences at the Hime on Broadway. It's quite a bit pricier than Sushiyama, but the food seems to be made with care. I don't frequent West Point Grey, but maybe the next time I do, I'll try out Hime. Sorry to put the suggestion here, since I see you've not been here and there's no other logical place for "general" comments. I was at Ikoi Sushi in New West on Friday for lunch. A Japanese owned/run resto not very noticeable from Columbia St. Very fresh fish. My sushi/tempura combo was made with care, the nigiri fish was buttery soft, cut thick and tasted slightly sweet and actually like the fish they are. The tempura was remarkably light, crunchy and devoid of grease. Service was friendly and attentive, but once the noon hour rush got into full swing the waitress became a bit stretched. Prices are about par with other restos in GVRD, the menu is fairly typical if a bit short on choices. Nevertheless Ikoi stood out for me for their authenticity.